Welcome to Echochamber Friday, where we intentionally read articles we normally would not. So we do not become frogs in a well, living under a bridge. Who does she think she is? is she Ally Sheedy? No. No she is not! She’s hot! Burn her! Burn the witch! Apparently this dance is part of the culture war thing. It has some significance. Don’t ask me. Something something trolls. Adorable! Super cute!! Charming!!! Washington (AFP) – An attempt to discredit new US congresswoman and leftist poster child Alexandria Ocasio-Cortez with a video of her dancing as a student backfired spectacularly on Friday, triggering eye rolls and a barrage of whimsical memes. The 30-second clip of a younger Ocasio-Cortez, now 29, strutting her stuff on the roof of a building quickly went viral on social media — but the troll attempt fell flat, with users rushing to praise rather than shame her. “Well, @AOC is officially done. She’ll never recover from the world seeing her… (watches video) …dancing adorably and having fun with her friends in high school?” tweeted the comedian Patton Oswalt, tongue-in-cheek. The edited clip that began circulating widely Thursday shows an upbeat Ocasio-Cortez twirling and hamming it up for the camera. “Here is America’s favorite commie know-it-all acting like the clueless nitwit she is,” read the original tweet from @AnonymousQ1776, who described it as a video from her high school days. The Twitterverse later unearthed the full video posted on YouTube eight years ago, when viral dance crazes began taking the internet by storm. 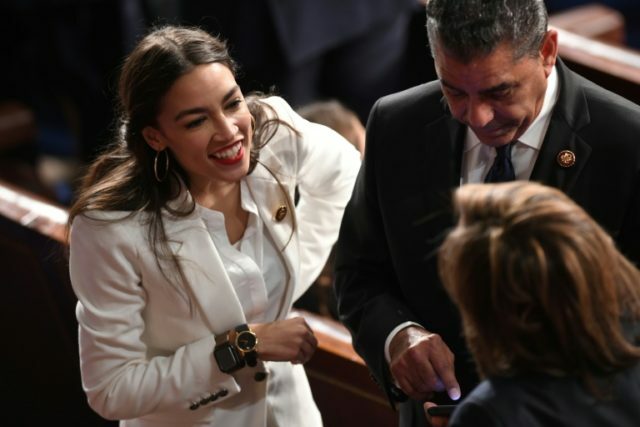 The trolling intended as a “gotcha” moment for the New York politician — who was sworn in to Congress Thursday, becoming the legislative body’s youngest woman ever — instead saw social media turn the video into a comical meme. “Cannot wait for my enemies to post a video of me spinning around looking super hot with the shiny hair of youth and act like they just caught me breaking into the Watergate Hotel,” tweeted writer Nicole Cliffe of the flubbed smear attempt. A Twitter account @aoc_dances unleashed a steady stream of posts setting the clip to dozens of popular tunes as well as classics like the National Anthem of the People’s Republic of China. Ocasio-Cortez is a favorite among American progressives, having burst into the public consciousness after beating a Democratic Party stalwart in her first political race, New York’s June primary. An ally of longtime progressive Senator Bernie Sanders, she has built her platform on championing her working class roots and Puerto Rican heritage. In response to the dancing video Ocasio-Cortez on Friday posted a fresh clip of herself shimmying into her office on Capitol Hill, as the counterculture classic hit “War” plays.